Viper Milton Karisa (right) tries to beat Onduparaka defender Simba Sibiri at the St. Mary’s stadium in Kitende on Tuesday. Photo by Shaban Lubega. FOOTBALL–The Azam Uganda Premier League (UPL) returned last evening with seven matches played across different stadiums. At Kitende, Vipers SC defeated Onduparaka FC 2-0 to close the gap on leaders, Sports Club Villa who now lead by just a point. Two early first half goals from Milton Karisa and Erisa Ssekisambu were all that the Venoms required to ensure maximum points at the St. Marys Stadium in Kitende. 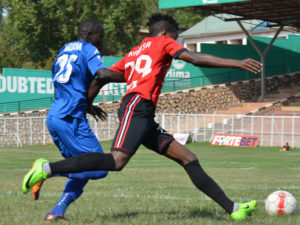 Karisa shot the Venoms ahead after just seven minutes moments after Daniel ‘Muzei’ Sserunkuma had been denied brilliantly by the visitors’ goalkeeper Nicholas Ssebwato. Ssekisambu, who has now scored three goals against the Catarpillars in all competitions doubled the lead two minutes later. Uganda Cranes head coach Sebastien Desabre watched the game at Kitende. At Wankulukuku, Express FC registered their first three points of the campaign under head coach Shafik Bisaso as they defeated Bul FC in a hotly contested match. After an evenly match first half where both teams created so little in front of goal, the Red Eagles took the initiative and brought the game to Bul. Ten minutes after the re-start, striker Isaac “Kasujju” Onyango rattled the cross bar with a ferocious shot inside the box after he was set up expertly by Micheal Birungi. With 18 minutes to play, Onyango would not be denied a second time when he tapped home a Alfred Leku cut back. Leku who had been a handful for the Bul defence all day ran through on goal late on but was denied by the Bul goalkeeper whose save fell in the path of Micheal Birungi to score the Red Eagles’ second of the day. The result means that Express who remained second form bottom now move to with in two points of Proline who occupy 13th spot. This was a vital three points for Express who bid to avoid relegation in a season they will live to forget. “It was crucial a get all three points today,” said Express FC coach Shafik Bisaso. “We will take each game as it comes and see how many points we can accumulate at the end of it all,” he added. Other results from Tuesday’s fixtures.